You will have the correct gearing for the mountains. None of the hassle of packing up and transporting your own bike. It might be cheaper (if you have 2 flights to get to/from your holiday) – Airline charges are around £40 per flight. Some airlines do not guarantee to transport your bike if the flight is full. We maintain the hire bike during the week. We clean the bike at the end of the trip! You get to try a titanium frame with SRAM Groupset. 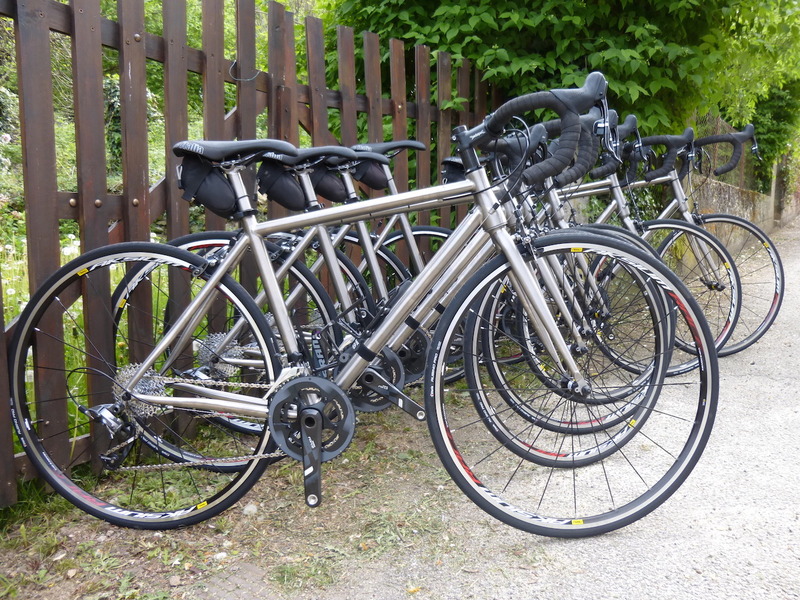 Marmot Tours has invested in a fleet of titanium framed bikes fitted with SRAM Force 22 groupsets. The custom built bikes have been designed for long hilly days, with a comfortable geometry and very low gears. 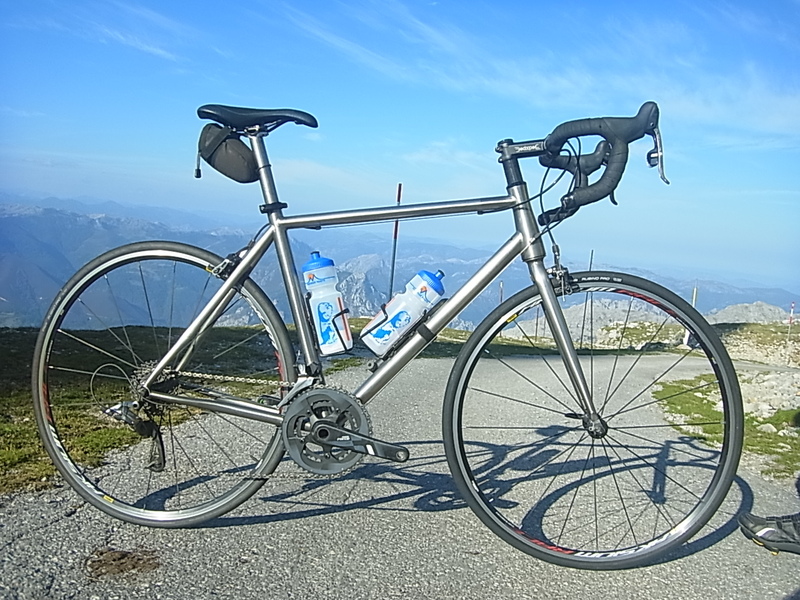 It is a bold move away from carbon frames, but the flexibility of titanium makes it an ideal material for our style of holidays and our clients have been thrilled with their hired ‘steeds’. The frames are hard wearing so stay in great condition, look like new, and are more resistant to damage. Titanium is slightly heavier than Carbon so we have fitted them out with high quality lightweight components. Titanium frame with sloping geometry offers comfort on long days in the saddle. Titanium forks absorb shock much better. SRAM Force 22 groupset which is lightweight and reliable with a smooth gear changing action. The brake hoods are comfortable (particularly for those with small hands) and it does not take long to get used to the ‘double click’ gear change. The new Force 22 is considered by many to be a higher quality groupset than Shimano Ultegra and has taken may features from the top end SRAM Red. Gear Ratios. 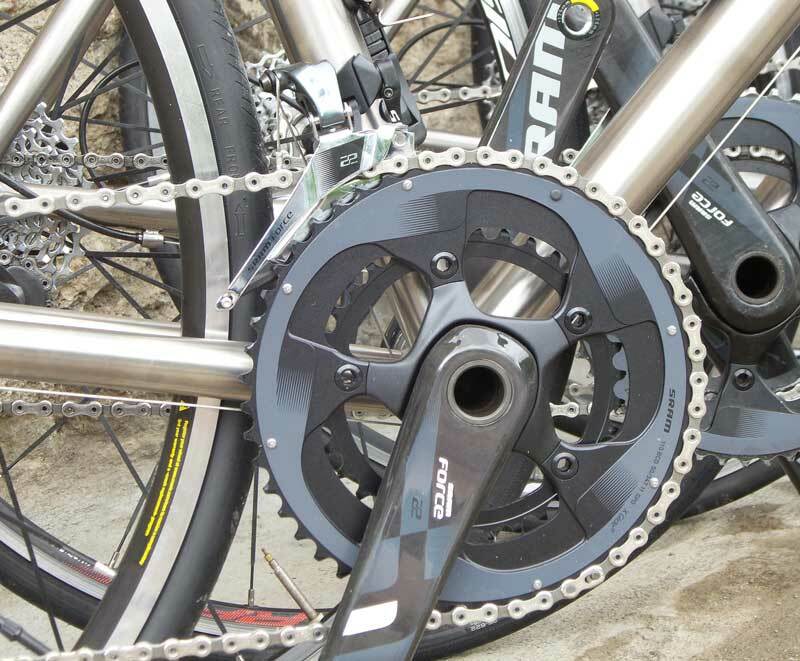 With a compact 50-34 chainset and the new 11 speed 11-32 cassette, we get a low gear of 28.7 inches. 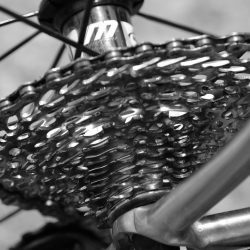 This is equivalent to a standard triple with a 28 tooth cassette, but has the advantage of being significantly lighter. Mavic Aksium wheelsets are well built and strong wheels for reliable and safe descending. The bikes have a recommended retail price of about £2800. As we have a limited number of bikes of each size they will be allocated on a first come, first served basis. It is important to us that your hire bike is the correct size and feels comfortable. We will allocate you a frame size based on the average body / leg length and the size chart below. 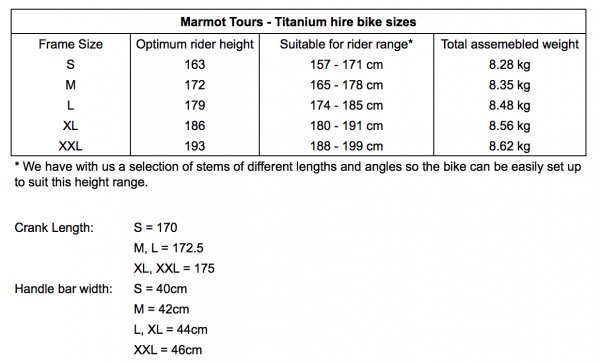 If you have particularly long or short legs / arms then please look at the charts below in relation to the dimensions of your own bike to ensure that you are happy with the suggested frame size. If you would like a different sized frame then please discuss this with us on booking. Also, if you are taller or shorter than the height range indicated in this chart (under 157cm or over 199cm) then we suggest that it might be easier for you to bring you own bike so as to be sure you have something that suits you well. We stock a range of stems (with different lengths and angles) which can be interchanged to help us set up your bike to a comfortable riding position. 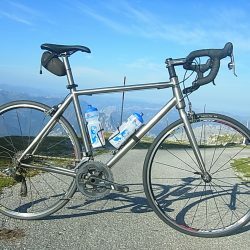 We feel very confident that we can provide a comfortable and successful bike fit for our clients, however, if you are very concerned about exact bike fit and matching measurements to your bike at home, then to allay your anxieties, we would suggest you bring your own bike with you for the trip rather than hire from our fleet. You can then relax on your own steed! What Kit is Supplied with a Hire Bike? Helmet hire is not included. Please bring your own or arrange hire on booking. It is compulsory to wear a helmet on all trips. The brakes are set up to the UK standard (right hand is the front brake), we are unable to change this. Standard pedals are provided – if you have shoes with cleats please bring your own pedals. If you have your own ‘tried and tested’ saddle then please bring it along. Mini-pumps, tyre levers and spare tubes are provided with all hire bikes in a saddle bag. Road Bikes DO NOT come with a bike computer – please bring your own if you need one (or bring a GPS). We ask you to sign a bike form when we provide you with your bike, which details your responsibilities as regards the care of your bike. 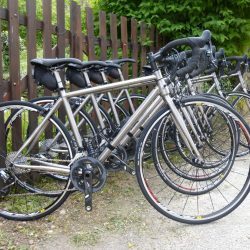 All bikes will have undergone a maintenance check prior to being hired to you, and will be checked every evening by the leader / bike mechanic on your holiday. Any maintenance required should be carried out by the leader or a bike shop. Chain set (front) – compact with 50 and 34 tooth rings. 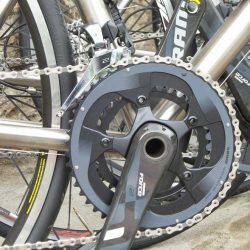 Free wheel cassette (rear) – 11 speed with 11 to 32 teeth rings. This makes the lowest gear (easiest for hills) 28.5 inches. 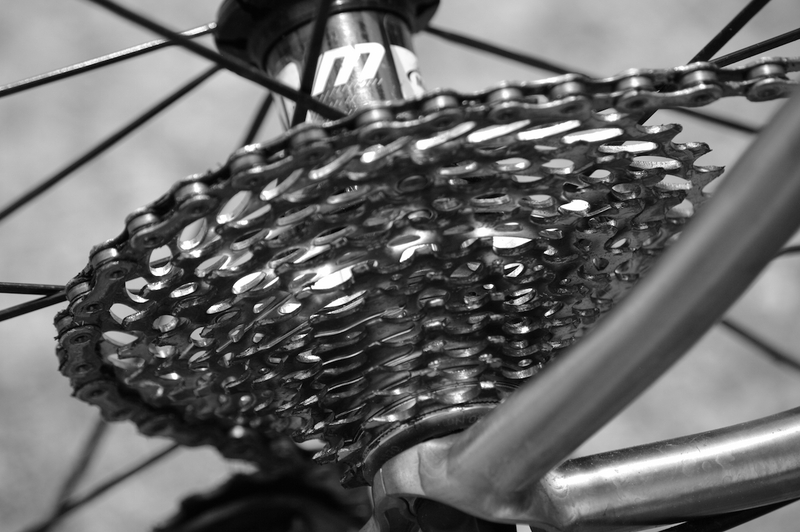 This is equivalent to a standard triple with a 28 tooth cassette, but has the advantage of being significantly lighter. Seat Post – 6AL/4V titanium.